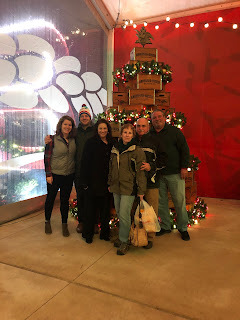 I figured after getting the lay of the land at last year's Anheuser-Busch Christmas party that this year it was time to share the wealth, so we invited our parents to join in the beer-soaked family fun! Many shrimps and beers did not make it out of this party alive. These chainsaw carving guys are my favorite. They had the Old Schoolhouse unlocked so we poked around in the museum there. Even Adolphus Busch was lively, and he's been dead since 1913. "The above piece was presented by the Directors of Waterford Crystal of Ireland to Anheuser-Busch in recognition of the company's involvement in the Budweiser Irish Derby." I can't believe I've been drinking normal Budweiser this whole time like a chump when there's been Budweiser Supreme somewhere out there all along! Budweiser Light breweriana from before they changed the name to Bud Light. "For over 30 years, this ® symbol was part of the 150-ft Budweiser sign that stood atop the Bevo Bottling Plant and welcomed visitors to the brewery. The entire sign was replaced with a new LED sign in 2013. At two feet wide, the ® is the smallest piece of this sign - the largest is the letter "B", which is eighteen feet tall and weighs 2,400 pounds. The "B" now marks the entrance to the Biergarten." I thought that the Bevo Boatcar was pretty amusing. "To assist the military effort in World War I, Anheuser-Busch's vehicle department developed a special land cruiser for use by the Army as a reconnaissance vehicle. This "boatcar" was capable of travel on both land and water, but before it could be put into production the war ended. The prototype did see service in several Liberty Bond drive appearances. Anheuser-Busch decided the Boatcar could be used as a promotional piece for Bevo and it was sent touring around the country to state and county fairs, auto races, trade shows and other special events as well as being made available to Anheuser-Busch distributors of Bevo to assist them with sales activities. A total of four Boatcars were ultimately produced with three being used to promote New Brew Budweiser (Budweiser that was dealcoholized to less than one half of one percent alcohol) during the remainder of the Prohibition years. With the return of legal beer on April 7, 1933, the boatcars were discontinued and sold." When Adolphus Busch introduced Michelob in 1896 he intended for distribution of this "connoisseur's" beer to be limited to only those outlets willing to adopt special handling procedures to guarantee that the brand's unique taste be protected. To help ensure this goal, Adolphus established the Michelob tavern in downtown St. Louis. The Michelob was not only an operative retail outlet, but also a "beer school" where owners and employees of other restaurants, clubs and taverns could be brought in and instructed on how to draft, handle and serve Michelob." Give Santa a few beers and naughty quickly turns to nice.